This article does not apply to Thunderbird 3, SeaMonkey 2, or Firefox 3 and above. 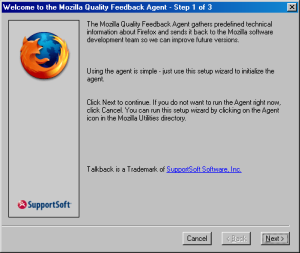 The Quality Feedback Agent (aka Talkback) activates when your Mozilla application crashes. It lets you send stack traces and other development information to mozilla.org engineers. This information helps developers improve new versions of the software. Talkback is usually bundled with Firefox, Thunderbird and the discontinued Mozilla Suite. It is not included in SeaMonkey 1.0 or later versions released to end-users, although it may be available in some "nightly" SeaMonkey test builds  . Note that, in Firefox 3, Thunderbird 3, and SeaMonkey 2, the Breakpad crash-reporting tool replaces the Quality Feedback Agent. To install the agent you may need to do a "Custom" installation and select "Quality Feedback Agent" component manually. If you installed Firefox Thunderbird or Mozilla Suite without the Quality Feedback Agent, the best way to do install it would be is to reinstall your Mozilla application (you won't lose your settings). Open the Extension Manager in Firefox/Thunderbird 2 ("Tools -> Add-ons -> Extensions") or in Firefox/Thunderbird 1.5 ("Tools -> Extensions") and look for an entry named Talkback. For other Mozilla products, look in the installation directory. There are other ways to get crash data besides using Talkback. Some distros, such as Fedora, provide debug packages that will allow users to obtain a stack trace one these packages are installed. In fact, some crashes are caused by patches that distros have added to their own packages and are not even Mozilla's fault! One other, more involved way of getting a stack trace for a crash is compiling a debug build of whatever Mozilla product you're using and using gdb. If Talkback isn't where it should be, then you will need to install it. Run the application from the path you located above. The agent user interface window will open and will contain a list of all the incident IDs (eg: TB28659753Z) that were sent to Mozilla servers. On Windows and Mac OSX, you can select an ID, or multiple IDs and copy them to the clipboard using the Copy Selected ID(s) button, or by using the right-click context menu copy (on Mac OS X, simply selecting the build ID pressing Cmd-C also works). Unfortunately, on Linux a copy feature does not exist and one must write simply write out the ID(s). On a new install, Talkback may be installed, but not enabled. If so, then running the application will set it up for the first time. The first time you crash, a window appears asking whether you want to turn the agent on or off. If you change your mind, you can change it under the Settings menu in the agent UI. You may be experiencing a hang rather than a crash. With crashes, the application will "disappear" immediately rather than stop responding. The agent can report only crashes, not hangs. If you are using a proxy server that requires authentication, the agent will not be able to send the reports to Mozilla's servers. Such authentication methods aren't supported yet. A workaround for username/password authenticating proxies on Windows is to set up the Proxomitron to add the authentication information, and set the agent to use the Proxomitron as its proxy. If one or more listed incident(s) have their incident ID shown as "Unknown", it usually means that their incident data has been saved but not yet sent. Make sure you are connected to the Internet, then use the "Incidents => Send unsent" menu item to send the incident data and get an Incident ID for each such incident. Contained in the data sent is a stack trace (where in the code the crashed occured and how it got there), the version and operating system, how long the program ran before crashing, and any data that you fill out. Statistics are compiled on all the incidents. Periodically, someone looks at these statistics and files bugs for the most frequent types of crashes, called "topcrashers". Individual incidents can be looked up with Talkback FastFind to help users find immediate solutions to crashes. Firefox FAQ: What is Talkback?